Hm very simple game... but original EP game! I love the original EP programs!!! The Paintbox manual is talking about NEOS mouse and Boxsoft intelligent mouse/joystick interface. Anyone can talk more about these items? The NEOS mouse was a mouse originally produced for the C64. Search the net for a ton of references. Box-Soft produced a small interface (plastic covered pcb) with a size of 2 cm. in with and 5 cm. in length that was plugged into the joystick port on the EP. The interface had a connector (standard atari format) for the joystick/mouse placed flat on top of the interface. 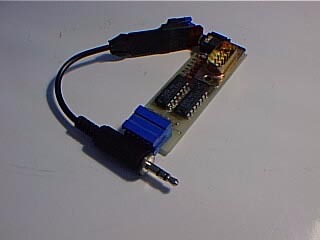 Because the interface used a lot of power you had to connect a second small interface in another port in the EP (smaller than the joystick) that had a wire with a jack-plug (some as for tape) in the end that you plugged into the mouse/joystick interface. It looked a bit weird but worked as a charm. I also had a couple of the Hungarian joystick interfaces but the BoxSoft version was better. Unfortunately I don't have any more information / drawings etc. This is the Boxsoft interface? Just found the same picture. The version I had was covered with thin black plastic. But is is the same. Big thanks for the tapes to Bagpuss22!!! Hello, Thanks for being so complementary about my programming abilities. I think I must have been about 16 when I wrote Out of this World. I never knew it had its name changed and my name removed when it went to Hungary. I knew Tim sent his software off to Eastern Europe, because he got some software back in return. He could never get any money out, though. Does anyone know what happened to Tim? I found this while Googling around and was surprised to see the Box-soft name. But, John, I can't quite remember you. Did we meet? I do remember going to one or 2 Enterprise meetings in London. Sorry if the Insane game disappointed you. I was quite young and got bored writing a game quite quickly. I always wanted to write shoot-em-ups, and still do get hooked on R-type from time to time (currently on the Wii). But I could never quite write them right. Just couldn't get the right playability. I helped Tim work on the Spectrum emulator for a while, but I don't know if it was released. It was a remarkably simple piece of hardware, with some software that would convert the colour (or "attribute") information from Spectrum format to Enterprise format. I think I re-wrote that code, but whether that's the version that is being talked about on some of these boards, I don't know. I then went on to use the Spectrum emulator to help write some Spectrum games for Codemasters (none of them any good, I'm afraid). My Enterprise eventually got totally destroyed with all the re-wiring and hacking that went on, so I have no hardware to show, I'm afraid. I still have some Enterprise disks lying around that I keep meaning to copy over and upload somewhere on the net. I don't know which could be acceptably released and which might still be considered copyright. I run a software company now, so have to be careful about legal issues. That Paint program was a challenge. Someone else wrote it and then I added to it. The source was too large to load into memory, so we used a version of WordStar running under CP/M to edit the source. Then there was a CP/M assembler to assemble the source code into the program. It took about 15-20 minutes each time to assemble that one source file. And I still configure every editor I use to treat shift-left as beginning of line, shift-right to go to the end, shift-up to go up a page, and alt-up to go to the top of the file. I'm used to it and I'm not going to change now. Does anyone else here do this? Nice to see one of the Box-Soft members in our forum! We have many-many questions about the Box-Soft and about the Enterprise user groups in the UK! I'm glad you found us! I want to see new (new for me) EP programs. Dan! Do you know anything about Tim Box? ¡Yesterday I've found Tim Box! adaptor for it. I then got someone to write a driver for it. mentioned until done. I came up with the idea. Spectrum code would read the keypress's. I will try and look up web page and continue the conversation there. Page created in 0.397 seconds with 29 queries.